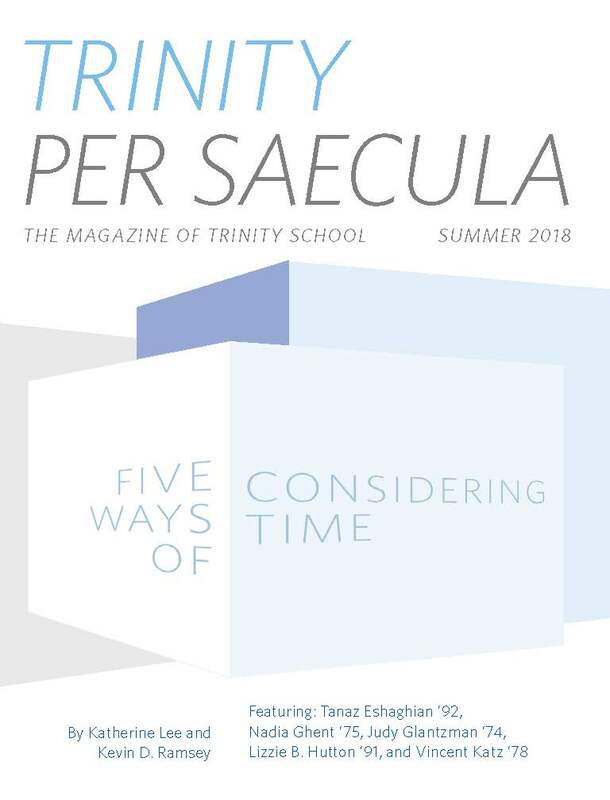 Considering Time, featuring interviews with Tanaz Eshaghian ’92, Nadia Ghent ’75, Judy Glantzman ’74, Lizzie B. Hutton ’91, and Vincent Katz ’78, “Classroom Comment” by Sonia Kanwar ’26, “Book Notes” with reviews of books by Diana Murray ’90 and Andrew McCarron, “From the Archives,” “Class News,” and “Last Word” by Janine Cuervo. 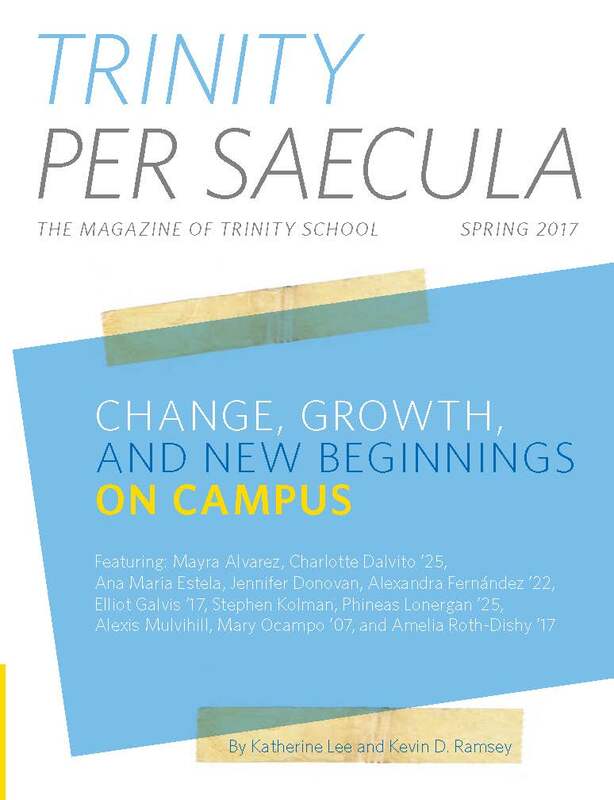 Featuring: Mayra Alvarez, Charlotte Dalvito ’25, Ana Maria Estela, Jennifer Donovan, Alexandra Fernández ’22, Elliot Galvis ’17, Stephen Kolman, Phineas Lonergan ’25, Alexis Mulvihill, Mary Ocampo ’07, and Amelia Roth-Dishy ’17; Classroom Comment by Rohan Sinha ’17, Reviews of books by Marguerite Elisofon ’74 and Daphne Uviller ’89; From the Archives; Class News; and Last Word by Olivia Kim. 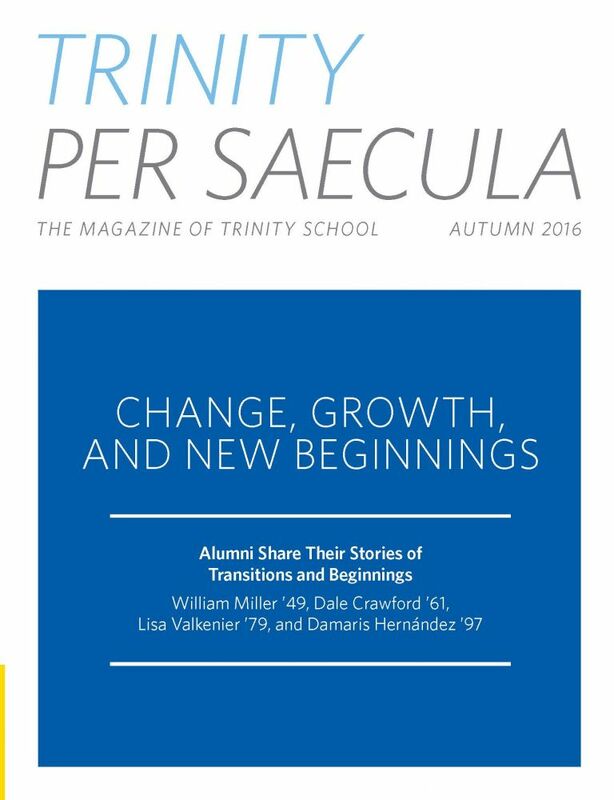 Change, Growth, and New Beginnings, featuring: William Miller ’49, Dale Crawford ’61, Lisa Valkenier ’79, Damaris Hernández ’97, Reviews of books by Nick Bruel ’83 and Kevin Jack McEnroe ’04, From the Archives, Class News, and Last Word by Jim Cifelli. 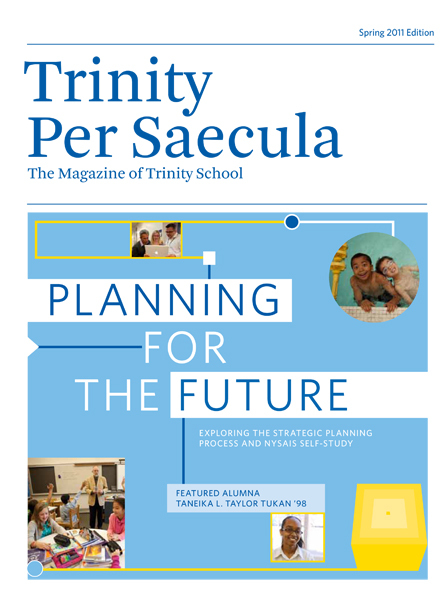 Featured in this edition: Turning Plans Into Realities with Paul Yager ’71, Anne Cooke Mitchell ’90, and Varick M. Shute ’98; Classroom Comment By Dimitri E. Galterio ’20; Class of 2011; Reviews of books by Walter Benn Michaels ’66 and Daphne R. Uviller ’89; Last Word By Julie A. Kourkoulis; Anna Ryan, Trinity Fund Supporter Since 2009; James B. Hicks ’63 and Alice Hicks Trinity Fund Supporters Since 1984. 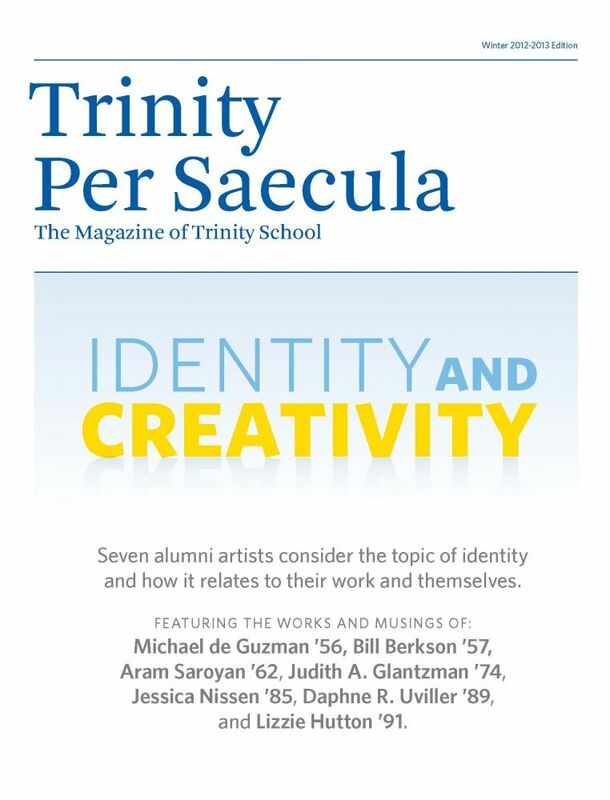 Featured in this edition: Trinity Fund Supporters Steve and Kim Erle; Classroom Comment by Jeremy K. Ferguson ’13; Feature article about identity including the works and musing of Michael de Guzman ’56, Bill Berkson ’57, Aram Saroyan ’62, Judith A. Glantzman ’74, Jessica Nissen ’85, Daphne R. Uviller ’89, and Lizzie Hutton ’91; Class of 2012; Reviews of books by John Varriano ’61 and Lizzie Hutton ’91; Last Word by Gabriela Saldana. 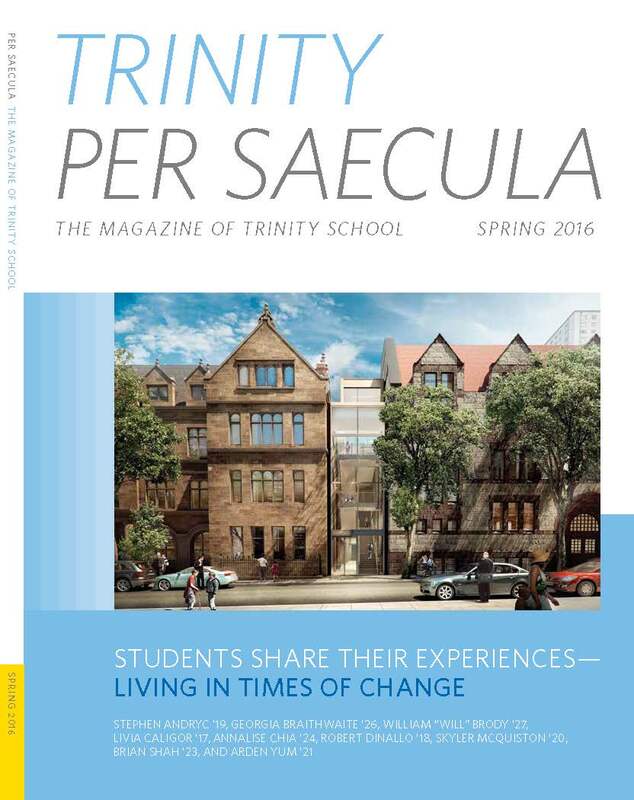 Featured in this edition: Trinity Fund Supporters Linda Sanchez and Gregory P. Ho; Classroom Comment by Julia A. McQuiston ’22; feature article about ten Trinity families who share their stories and give us insight into who they are as families and as individuals. 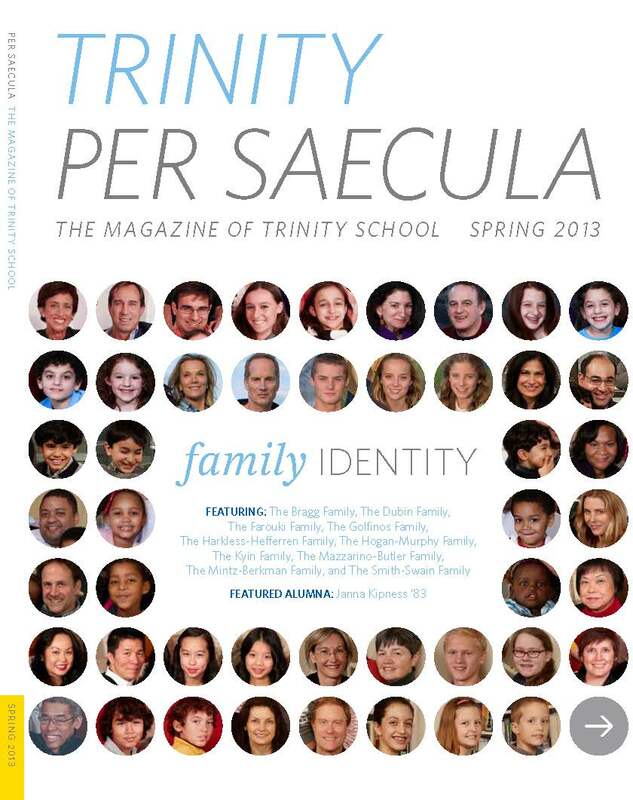 Featuring profiles of: the Bragg family, the Dubin family, the Farouki family, the Golfinos family, the Harkless-Hefferren family, the Hogan-Murphy family, the Kyin family, the Mazzarino-Butler family, the Mintz-Berkman family,and the Smith-Swain family; reviews of books by Stephen H. Longmire ’85 and Colson Whitehead ’87, Class Notes, and In Memoriam. 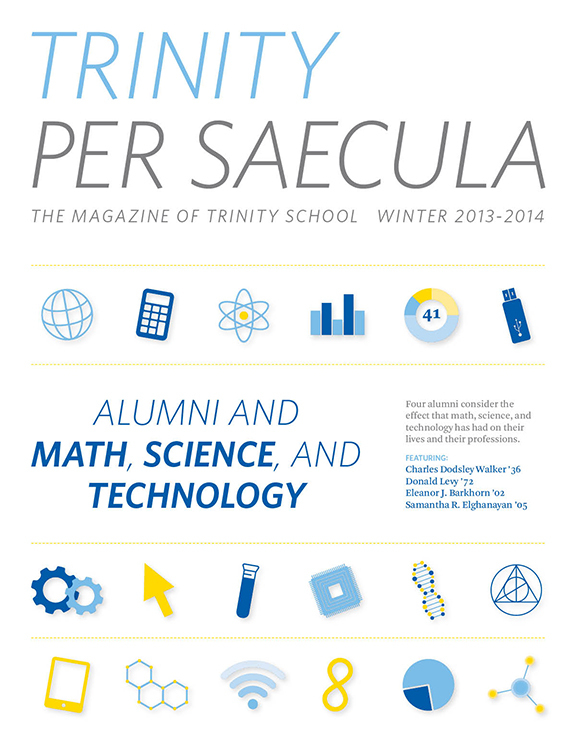 Featured in this edition: Trinity Fund Supporters Alan and Kim Hartman; Classroom Comment by Julian Hornos Kohl ’18; Feature article about alumni and math, science, and technology, featuring profiles of: Charles Dodsley Walker ’36, Donald Levy ’72, Eleanor J. Barkhorn ’02, and Samantha R. Elghanayan ’05; reviews of books by Karen Shepard ’83 and Jessica Soffer ’03; Last Word by Linda Chiao; and Trinity Fund Supporter Jemina R. Bernard ’93. 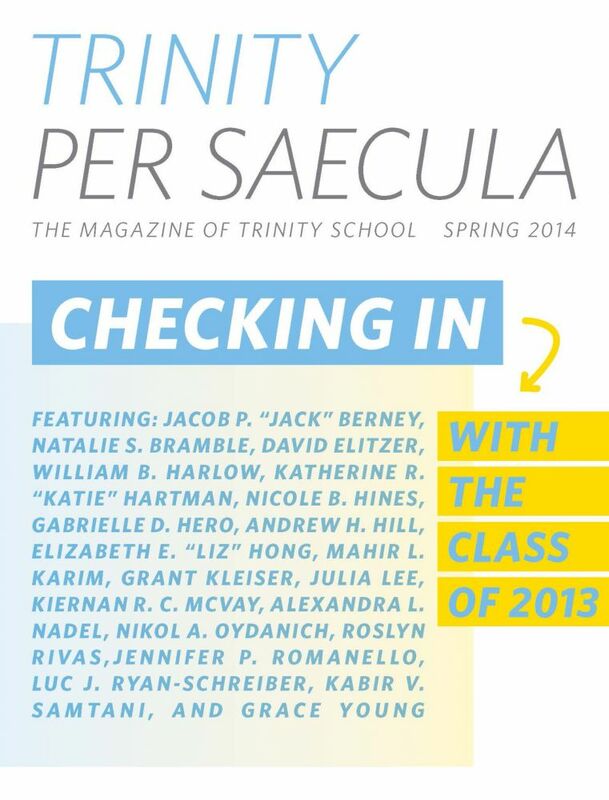 Featured in this edition: Classroom Comment by Nivita Arora ’15; Feature article about the class of 2013 featuring: Jacob P. “Jack” Berney, Natalie S. Bramble, David Elitzer, William B. Harlow, Katherine R. “Katie” Hartman, Nicole B. Hines, Gabrielle D. Hero, Andrew H. Hill, Elizabeth E. “Liz” Hong, Mahir L. Karim, Grant Kleiser, Julia Lee, Kiernan R. C. Mcvay, Alexandra L. Nadel, Nikol A. Oydanich, Roslyn Rivas, Jennifer P. Romanello, Luc J. Ryan-Schreiber, Kabir V. Samtani, Grace Young; reviews of books by Maxine McClintock and Najla Said ’92; and Last Word by Benjamin Stern. 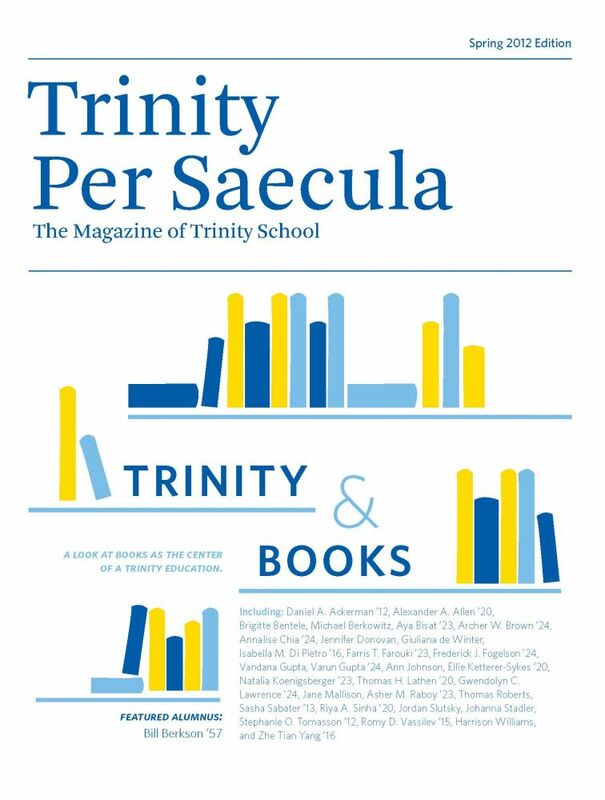 Featuring: Thomas Goodman and Marie J. Vogliano; Classroom Comment By Finn Guillemin ’23; Shared Alumni Experiences with Robert Scheelen ’62 and his wife, Dolores, Jordan Longert ’07 and Noah Conti Blitzer ’05, and Renée Chung ’01; Class of 2014; Reviews of books by Emily J. Levine ’97 and David Huyssen ’98; From the Archives; Class News; Last Word By Marilyn Lawrence, PhD; and Craig R. Kallman ’83. 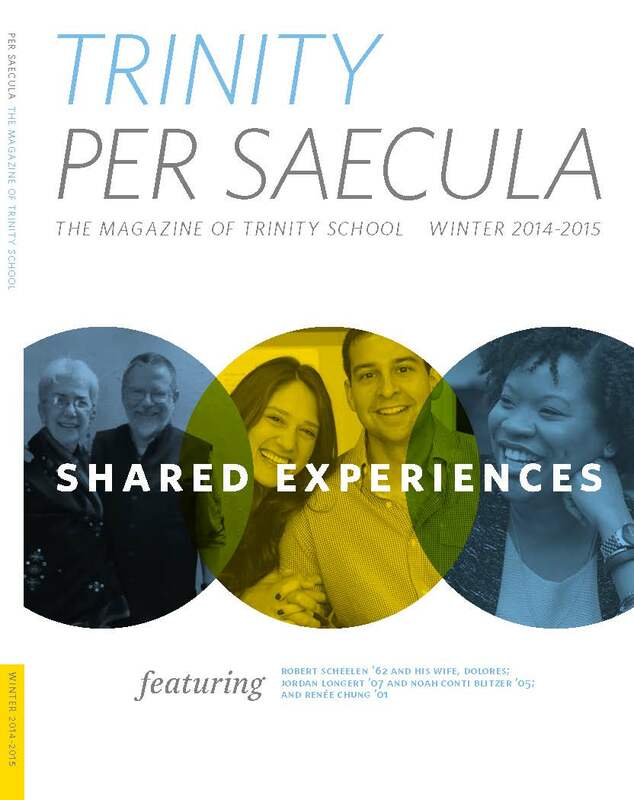 Featured in this edition: The J. Bruce Llewellyn Cultural Change Initiative Fund, Classroom Comment by Samira Iqbal ’19, Shared Experiences by Katherine Lee and Kevin D. Ramsey, Reviews of books by Charles Edel ’97 and Kristina Pérez ’98, From the Archives, Class News, In Memoriam, and Last Word by Rebecca Maas and Pierangelo Rossi. 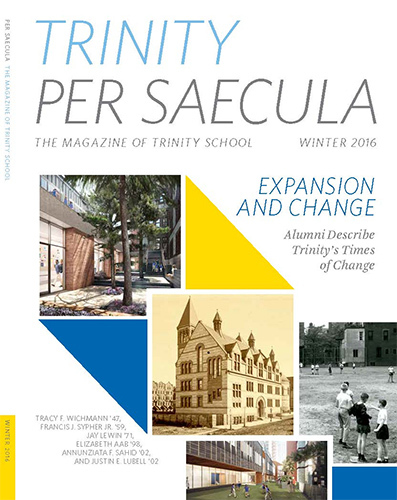 Featured in this edition: EXPANSION AND CHANGE: Alumni describe Trinity’s times of change with Tracy F. Wichmann ’47, Francis J. Sypher Jr. ’59, Jay Lewin ’71, Elizabeth Aab ’98, Annunziata F. Sahid ’02, and Justin E. Lubell ’02; Classroom Comment by Amanda Lopez ’16; Reviews of books by Catherine E. Price ’97 and Brian DeLeeuw ’99; Class News; and Last Word By Teacher of Math Mario Maullon. 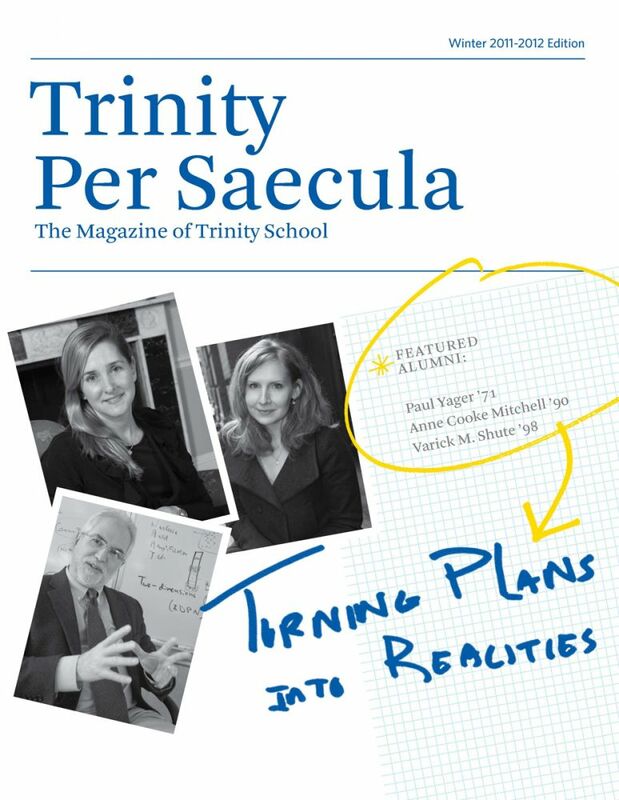 Featured in this edition: Christine and Alan Vickery Trinity Fund Supporters Since 1998, Classroom Comment By Katharine M. Witteman ’11, Planning for the Future Exploring the Strategic Planning Process and NYSAIS Self-Study, Featured Alumna Taneika L. Taylor Tukan ’98, Reviews of books by Nicholas T. Bruel ’83 and Catherine E. Price ’97, Last Word By Andrew McCarron, Lauren Snow Royce ’97 Trinity Fund Supporter since 2002. 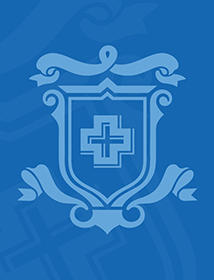 Back *Please make ebook@sinecharta.org an approved e-mail address so that your magazine doesn't end up in your "junk" or "spam" folder.